The Peregrine Falcon, Alex, is my Journey Animal Totem, meaning that throughout my life she comes and goes, randomly slipping in to help me with my current predicament or dilemma. 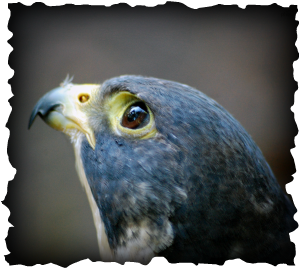 Falcons are called upon when we need higher vision to solver a current issue in our lives. It is also the solar emblem for success and victory. The falcon was the symbol of the rising sun in Egypt and was also known as the kind of all birds. Many gods in the Egyptian pantheon are portrayed as having the head of a falcon. In the European tradition, the falcon represents the huntsman, and is associated with German sky gods such as Frigg and Loki. Falcons also stand for speed, agility and grace. It shows how to recognize opportunities and seize them. They also stand for; superiority, spirit, light, power, focus, prophecy, freedom, aspiration, intensity and determination. This is a general idea of all falcon totems, buy my particular totem is a Peregrine Falcon whose name derives from the Latin word, Falco Peregrinus which means foreigner or stranger because this is a migratory bird. This also means that it ca help one to accept the change that is happening in one's life. This type of falcon is primarily used in falconry, because of its intellect and superior agility. It encourages for us to calculate and to make strategies in our life to help us obtain the goals we have set our minds and hearts to. Falcons are all about focus, to help us reach our goals in life.